The German military doctors treated from August 1914 to July 1918 approximately 27 million wounded and sick soldiers (official numbers from August-September 1918 on are incomplete). These include about 5,7 million wounded and 21,5 million sick. Of these, 94,5% returned to active duty, 1,7% died (400.000) and 3,8% did not return to active duty (900.000). This shows that the German Army managed to put into use a very effective medical service. How was this organized? As I have only a limited amount of time at my disposal, I will restrict myself in a first part of this presentation to a general overview of the German front-line medical service and in a second part to a few specific examples concerning Flande rs. The medical service could not be separated from the rest of the German army. Medical units and personnel could be found throughout all layers of the army and the lines of communication. The medical service was overseen by the Feldsanitätschef in the German General Headquarters, Generaloberarzt Otto von Schjerning. He was born in 1853 and had studied military medical sciences in Berlin. 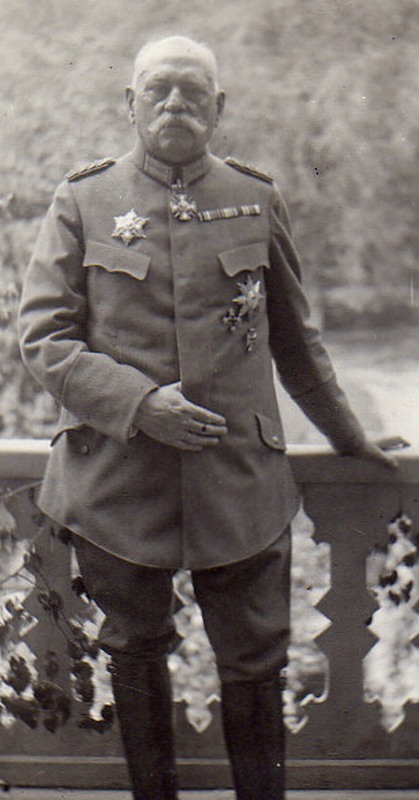 He had a purely military medical career and was head of the Sanitätskorps since 1905. Each Army headquarters had its own Armee-Arzt with the rank of Obergeneralarzt (Major-General). He was in charge of medical services within the army area and the Etappe (lines of communication). Each Corps within an Army had its Korpsarzt, who was assisted by a beratender Chirurg (consulting surgeon) and a beratender Hygieniker (consulting hygienist). In 1914 each active Army Corps had 12 Feldlazarette (field hospitals) and 3 Sanitätskompanien (bearer companies). As the German army restructured these units became mostly divisional units, although some field hospitals were retained on Corps level. The number of Feldlazarette per corps was reduced to 6 during 1915. The Etappenarzt, also assisted by a surgeon and a hygienist, was in charge of the medical services in the rear areas and was as such responsible for the Kriegslazarette (war hospitals), the transportation of wounded and medical supplies and also the general health in the rear areas (also overseeing civilian health in occupied territories). Each Division had a Divisionsarzt who was in charge of divisional medical units and also the medical officers and personnel within the fighting units the so-called regimental medical service). In 1914 each division received one or two bearer companies. This was later reduced to one bearer company per division, but in 1916 (Battle of the Somme) it was clear that one bearer company per division was not enough. In 1917 the number of bearer companies per division was set to two and further independent bearer companies were available higher up to reinforce where and when necessary. As the divisional level grew more and more important and the divisions were no longer tied to their original Army Corps from 1916-1917 on, each division received two Feldlazarette. The regimental medical service consisted of a regimental senior medical officer and two junior medical officers per battalion. Next to these there were 4, later 5, medical NCO’s (one per company + one in reserve) and 16 stretcher bearers. All of these belonged to the non-combatants of a fighting unit. In the trenches, usually each company had its own small aid post close by. A bit further back a regimental aid post (Truppenverbandplatz) was established, where there was place for app. 30 wounded and medical supplies for 5 days. The regimental medical service also had a Ortskrankenstube in a village in the rear, where patients, usually sick men, could be kept for 5 days at most. From the Truppenverbandplatz the wounded and sick were evacuated by the bearer companies (Sanitätskompagnien). A few kilometre behind the frontline was a Wagenhalteplatz (comparable to an advanced dressing station). There was a small detachment there and at least one of the wagons was constantly at hand. From here wagons went forward to collect the wounded or going towards the back to evacuate them. Walking cases were sent back after being collected at the Wagenhalteplatz, usually in small groups. The bearer company established the Hauptverbandplatz (main dressing station) a few kilometres further back. All wounded had to pass through this post and there was motorized transport available. Motorized transport was mainly taken care of by the Etappen-Sanitäts-Kraftwagen-Abteilung. Every wounded man must have two diagnosis tallies attached to him (usually done by the regimental medical service). These tallies had two red perforated margins. These margines were to be torn off according to the condition of the wounded. If he was able to walk, the two margins were torn off, if he was fit to be transported, one margin was torn off and if he was unfit for transport the card was left intact. 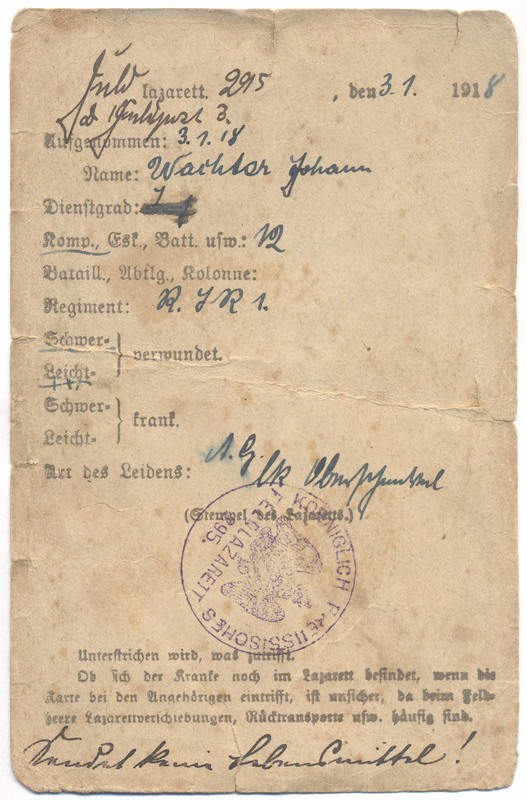 If somebody was encountered without a tallie, he was sent back to his unit, unless he was found to be suffering from sickness or wound, in which case a card could be attached at the Hauptverbandplatz and the unit would be informed. A Leichtverwundeten-Sammelstelle was established even further back, usually near an entraining station. Slightly wounded went there usually on foot. Feldlazarette (field hospitals) were opened in villages behind the front, usually in school buildings, convents or churches. Usually there were two Feldlazarette per division. They had a staff of 6 medical officers and were expected to be able to take care of 200 beds, although this number could be increased for a short period of time if necessary. In quiet sectors, field hospitals tended to specialize in certain diseases or wounds. This made sure that the best possible care could be given to the wounded and sick and increased the chances on a full recovery. Even though the buildings stayed the same, the staff changed each time a division moved in or out of the sector. 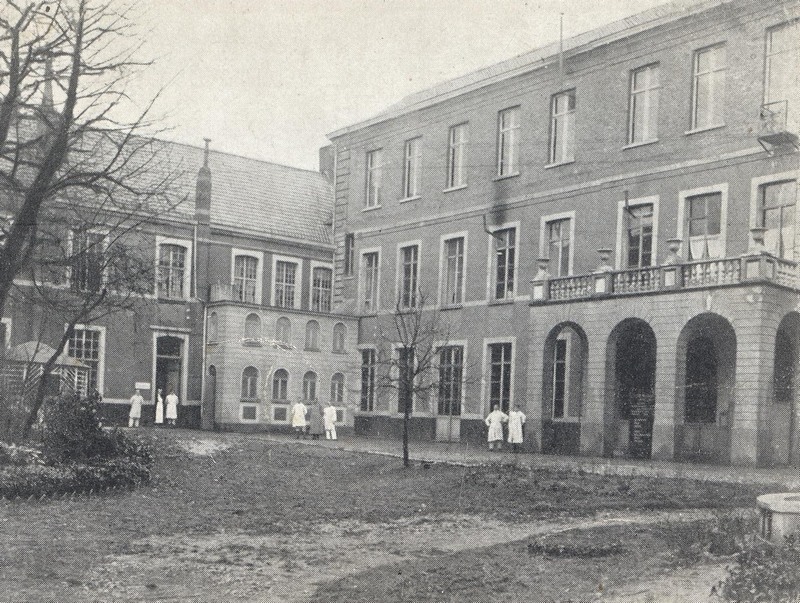 To give an example: even though the convent of the sisters of the Holy Family in Moorsele was used as a medical facility from Spring 1915 to Fall 1918, mainly as a field hospital, the unit itself manning the hospital never stayed the same for more than 6 months, but changed with the division that held the sector. The continuous change in field hospitals, especially in the periods of heavy fighting (f.i. Third Ypres) did not always guarantee the best care for the wounded. The writer of the war diary of Feldlazarett 253 noted a harsh remark in November 1917, when the field hospital moved away from Lichtervelde and the wounded were transferred to (Armee-)Feldlazarett 394. He wrote that the care for the heavy wounded in a hospital which had only previous experience with lightly wounded and healing patients, was to be seriously questioned. In the Etappengebiet were established several Kriegslazarette. 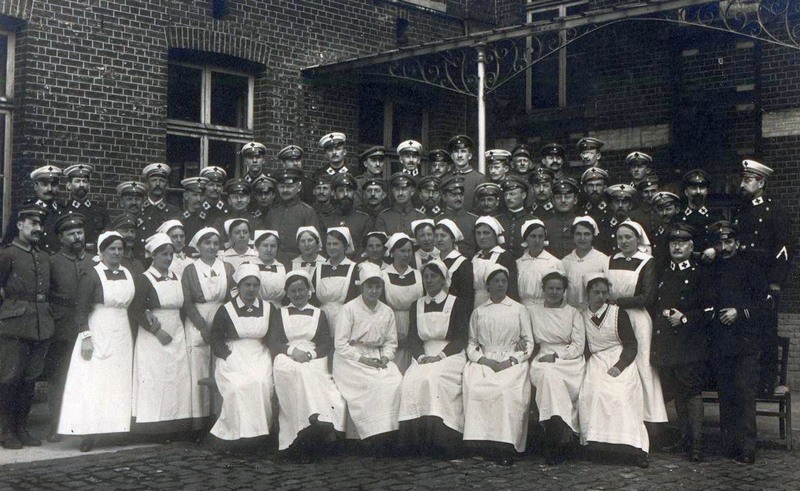 These were mainly local hospital buildings, schools or other large buildings staffed by mainly local personnel (both doctors and nurses, in Belgium mainly female sisters from catholic orders). There was a nucleus of German medical personnel to start up these Kriegslazarette. Each Corps had a Kriegslazarettabteilung whose responsibility it was to open these hospitals. They treated special classes of wounded who were not sent back to Germany and infectious diseases (so-called Seuchenlazarette). It was dangerous to transport this last class of sick so they tried to heal them locally. The Germans had f.i. in Deinze one of these hospitals especially for infectious diseases (typhus) in the Institute of the Maricolen. 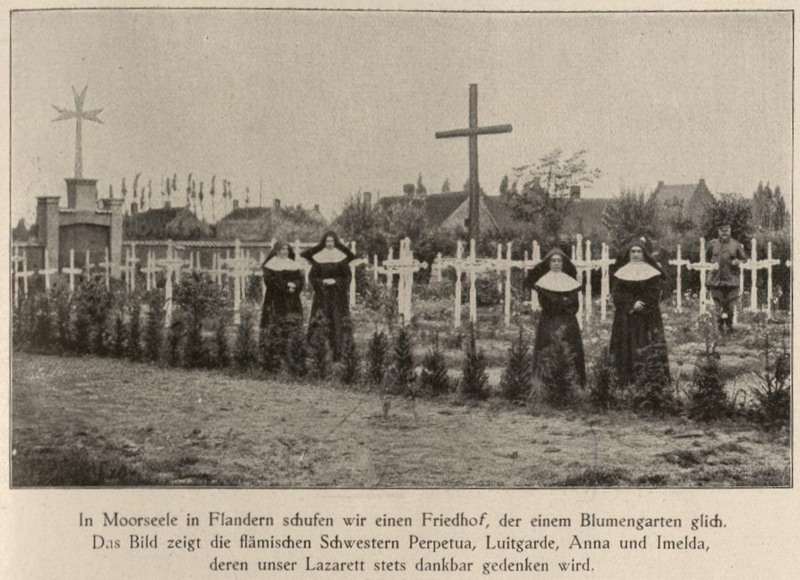 Normal Kriegslazarette were to be found in Izegem and Kortrijk. That’s the theory in big lines. Let’s look at a few practical examples of the use of German medical services during the war. The XXVII. Reserve Corps was one of the newly raised army corps, mainly consisting of older reservists and war volunteers. These corps used a more reduced composition, also medically. Each of the two divisions had two Feldlazarette at its disposal and only one Sanitätskompagnie. This was immediately considered to few and extra Feldlazarette were asked for for the newly raised reserve corps. These Feldlazarette came from other corps along the front that gave up one of their 12 Feldlazarette. It took until early November before these Feldlazarette arrived. The XXVII. 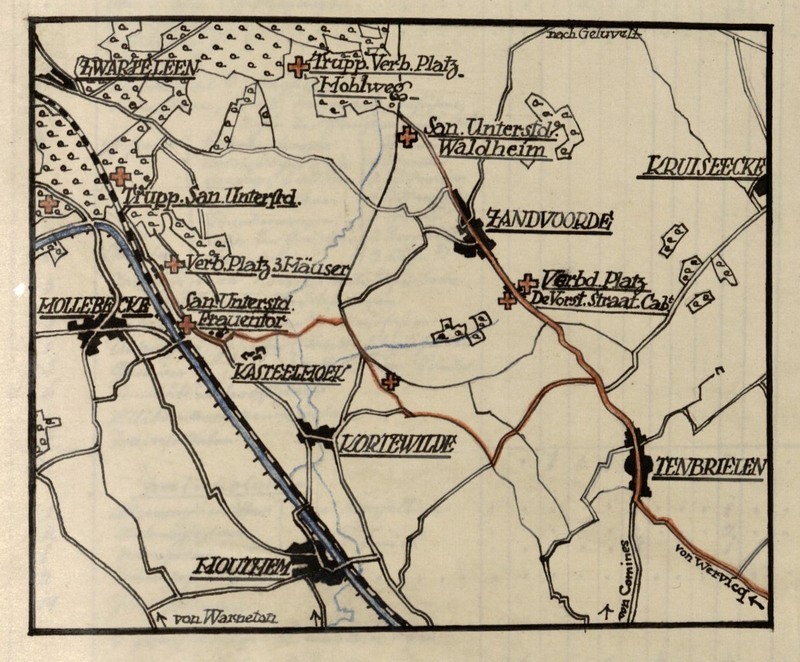 Reserve Corps got mixed up in small-scale fighting on 19 October 1914 near Moorsele and Rollegem-Kapelle, but the real fighting started on 20 October. Especially the 54. Reservedivision was engaged in heavy fighting for the village of Beselare and the Reserve-Sanitätskompagnie set up a Hauptverbandplatz in Dadizele. From 21 October on, the fighting increased in scale. The casualty rate went up dramatically for little or no gain of ground. Reserve-Sanitätskompagnie 53 set up its Hauptverbandplatz in Strooiboomhoek, a small hamlet north of Dadizele, in tents. It moved forward for a short while, but had to go back to Strooiboomhoek after being shelled. From 21 October to 3 November 1.290 wounded passed the Hauptverbandplatz. Reserve-Sanitätskompagnie 54 treated some 3.500 wounded between 20 October and 4 November, by which time it had moved South to Geluveld and Geluwe. Reserve-Feldlazarett 91 had established itself in the church of Moorslede and had also used the school and the brewery in Moorslede. From 23 to 29 October it had treated 1.719 wounded. Reserve-Feldlazarett 92 was put up in the château of Dadizele, but was relieved there on 24 October by Reserve-Feldlazarett 93. The hospital in Dadizele had treated some 2.000 wounded in October alone, the sheer amount of work had made a thorough bookkeeping impossible. After being relieved in Dadizele, Reserve-Feldlazarett 92 moved to Moorsele, where it established a Leichtverwundetensammelstelle and moved to Lendelede on 29 October. Reserve-Feldlazarett 94 used Ledegem (hospital, church and school) as its base. The whole medical organization was not really good as the slightly wounded were not treated by the Leichtverwundetensammelplätze, but went to the Hauptverbandplätze. In October the 53. Reservedivision had some 1.250 casualties and the 54. some 4.700. The low number of the former had to be reviewed as some 2.000 were found to have passed through the medical services of the 52. Reservedivision. The arrival of twe extra Feldlazarette early November improved the situation: Feldlazarett 3 des XII. Armeekorps was set up in Sint-Eloois-Winkel, Feldlazarett 8 des X. Armeekorps was engaged as Leichtverwundetensammelstelle in Ledegem. After the fighting calmed down from 11 November 1914 onwards, the medical services of XVII. Reserve Corps were reorganized. The XXVII. Reserve Corps had a Kriegslazarettabteilung, numbered 127. The unit got mixed up in the confusion and travelled by train from here to there until it finally arrived in Kortrijk on 27 October 1914. The civilian hospital there was already in use for the German wounded and they were being treated by local doctors and nurses. Especially Dr. Lauwers was very active in the care for the wounded. The Germans prepared and used from 30 October onwards the following buildings as Kriegslazarett: the Convent “het Fort” and the museum (Cloth hall). Other buildings were in the meantime prepared as well: the Convent Picpus, the Convent Saint Nicolas, the Convent of the Passionists and the City Hospital. A pharmacy was et up, using mainly conquered material. Most of the city’s pharmacies had no stock, but luckily for the Germans a rail wagon filled with medical material was captured at the station. 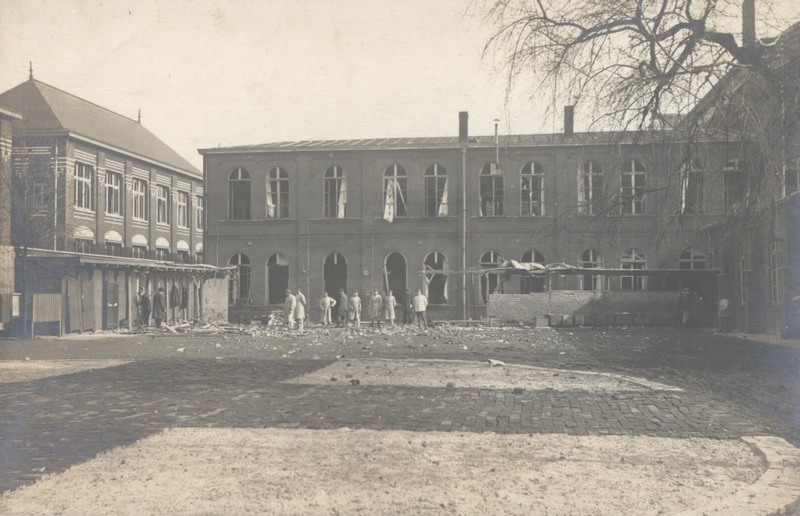 The Kriegslazarette in Kortrijk were taken over by the Kriegslazarettabteilung des Gardekorps as the Kriegslazarettabteilung 127 moved to Izegem in November. The Kriegslazarette in Kortrijk stayed in use until Third Ypres, when the changing situation at the front made the Germans to move them further back. The buildings were mostly used by Feldlazarette at that point. The calmer period from May 1915 on was used to improve the medical organization. One of the main tasks for some of the Sanitätskompagnien was taking care of all the dead that had been left behind on the battlefield or were buried in hastily dug field graves. This was the time when dozens of new concentration cemeteries were started. As the Germans allowed the family to fetch the body of their deceased relative to be buried in the Heimat, this caused quite a bit of work for the German medical services as they had to be present at the excavation. From 1915 to early 1917 many thousands of German soldiers were reburied and probably several hundreds were excavated to be brought home. The hospitals during this period improved their service by specializing. The 4 to 6 Feldlazarette of one corps, that were usually holding a sector for a longer period of time, specialized for certain wounds or diseases. For this, they even acquired special equipment and exchanged doctors and personnel to improve their level. All this led to a sharp decrease in fatalities. Special and prototype equipment and material was also made available by German companies. A mobile Röntgen machine went from hospital to hospital so that f.i. hard to find shrapnel pieces could be located and removed. Preventive medical care was also widespread: an increase in typhus cases in the winter 1914-15 led to an extensive vaccination campaign, not just for the German military but also for civilians in occupied Belgium and France. 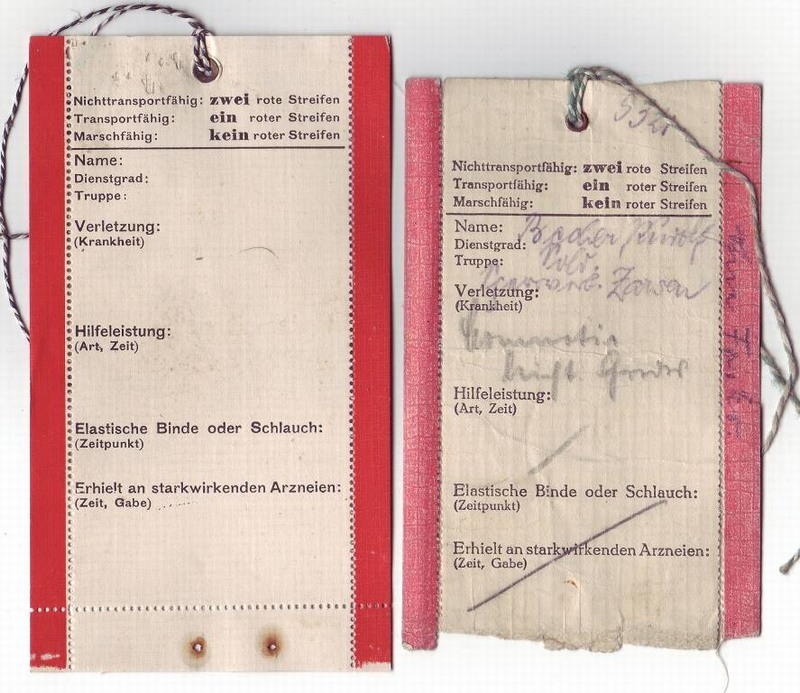 Even though officially forbidden, German military doctors treated civilians when time and means permitted. The Sanitätskompagnie belonged to the 204. Infanterie-Division, which held the front line from White Chateau near Hollebeke to a bit South of the Menin Road. The Hauptverbandplatz was made in Wervik, while the Feldlazarette were in Menen and Wevelgem. From May on the Hauptverbandplatz was moved to Geluwe. After the experiences in the Battles of the Somme and Arras, the Germans improved their defences using lots of concrete bunkers. From February 1917 on, this also meant that concrete reinforced dressing stations were built. A few dozen men of Sanitätskompagie were detached to build concrete bunkers, one near Dreihäuser and one near De Voorstraat, Southeast of Zandvoorde. 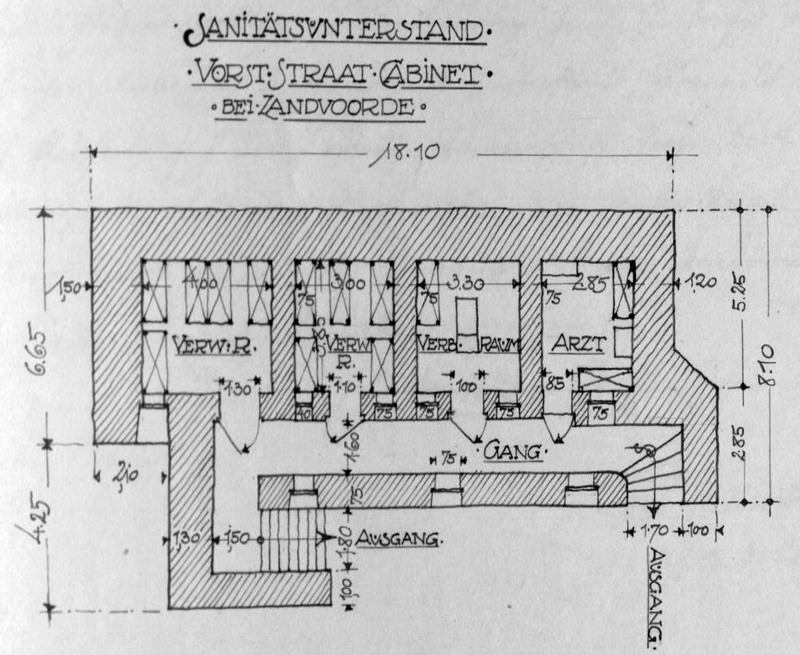 The bunker at De Voorstraat was ready just before 7 June and was put to use immediately. As the divisional sector wasn’t overrun on 7 June, the medical evacuation could be handled as planned, although under difficult condition close to the frontline as there was very heavy artillery fire. 778 wounded and 312 sick were treated at the Verbandplatz De Voorstraat on 7 June. The bunker there proved to be invaluable to work safely. The Operations- and Etappengebiet became more and more dangerous places during 1917. Areas that were out of reach for longe-range artillery fire, were bombed from the air. The huge red crosses on a white background that were on the hospital rooftops were ordered to be even larger. Preferably red crosses at least 15 metres large, made from red bricks with a white background made out of white gravel stone, should be placed close to the hospital buildings. These crosses should be visible from 5000 metres high. All this was not enough to prevent hospitals from being bombed. One of these bombing raids hit Feldlazarett 255 in Lichtervelde in the night of 26 to 27 October 1917. Four bombs fell on the building during a moonlit night. 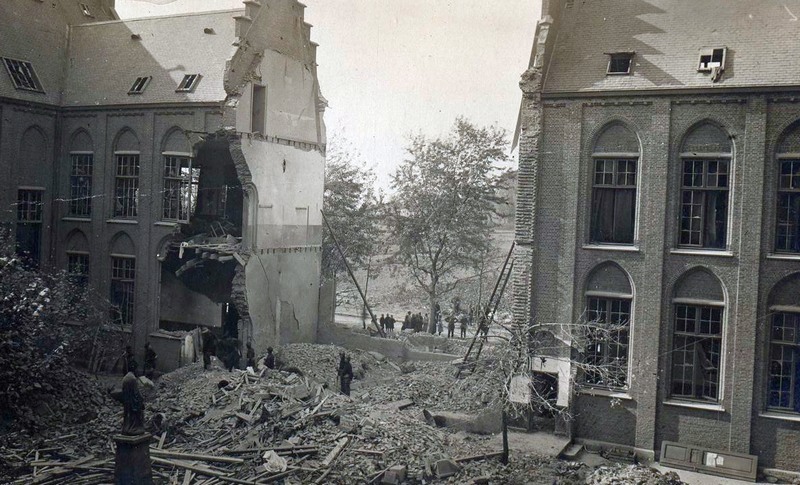 Several members of the medical personnel were killed or wounded, also four or five Belgian nuns from the convent. An immediate emergency evacuation of the wounded and sick to another hospital with the help of military units from nearby managed to save most of the wounded but a lot of the medical equipment was lost, some of it being stolen. The hospital was out of action for the time being. Dit bericht werd geplaatst in English. Bookmark de permalink . Very interesting detailed work and description with rare and usefull pics. Where can I find the second part about flandres which is mentioned in the introduction.